Fungilab aims to expand the scope of scientific instrumentation, and the latest V-Series instruments are prime examples of the company’s commitment to do just that. The FGB V-Series is a smart solution that merges powerful functions of programming and customization, that can adjust to suit many applications. These viscometers feature 3 different heads (L, R, or H) which can be easily interchanged to cover a wide range of viscosity measurements. The devices include a Push, Plug, and Release (PPR) System for quick and efficient spindle changes. Helicoidal movement (Heldal accessory) is incorporated into the V-Compact for viscosity measurements of non-flowing substances. The main display includes readings for: speed, temperature, shear rate, sheer stress, density, and both dynamic and kinematic viscosity. Programming options let users create and edit multiple protocols, store methods, as well as choose between Time To Torque (TTT), Time To STOP (TTS), and Step and Ramp The V-Series Viscometers from Fungilab operations. Customization features allow users to create lists of speeds, activate or deactivate Quality Control (QC) limits or out of range alarms, and change the axis values on the display. An additional graphic mode allows the data to be displayed with real time charts. future testing purposes. Experiments can be exported in either pdf or csv formats. There are many additional features and optional accessories which enable enhanced performance and function. Viscosity and temperature calibrations are user-enabled and customizable -- and easily reset to factory defaults. Temperature can also be adjusted to allow an offset. The Auto-Test function supports automatic calibration with sound and visual alarms, whereas, Auto-Range displays the maximum viscosity range for the selected spindle/rpm combinations. Easily the most innovative features of the V-Series instruments are the wireless access capabilities. The devices are controlled using an intuitive mobile application on an tablet. Available free from the Google Play Store, the Fungilab Mobile APP enables users to maximize efficiency by enabling features such as: remote access, improved Wi-Fi and Bluetooth functionality, and online chat assistance. Access to the Loyalty and Rewards Program allows users to view their accounts and keep track of any earned points as well. In addition to rotational viscometers, Fungilab specializes in kinetic viscometers, rheometers, standards, and accessories built to suit research laboratories and applications in fields including pharmaceutical, cosmetic, food, and R&D. The company is breaking new ground in the process scale markets as well. As a further testament to their expertise in the field, Fungilab offers a series of Viscolearning Services accessible through the website. Details on the physics of viscosity and rheology are provided as well as a Frequently Asked Questions (FAQ) section. The ‘My Fungilab’ feature is a useful tool with which to enter experimental details including sample type, volume, and desired output. The tool then connects the user with the proper instrument based on the input. 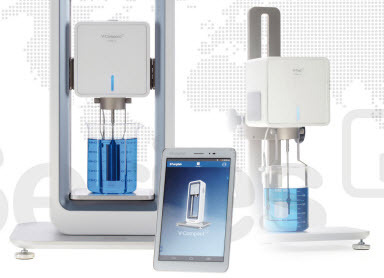 Fungilab has set new standards with the impressive V-Series viscometer line. Industry recognition has included the Red Dot 2016 Product Design Award given to the V-Compact. As one of the world’s most prestigious design competitions, the Red Dot award is a coveted accolade exclusively given to products that stand apart from the competition in superior design and innovative character. The V-Compact was also named the winner of Industry Business Outlook’s 2015 Silver Award for industrial design.